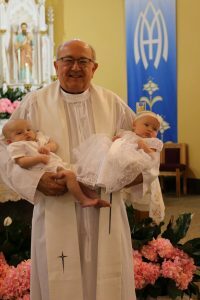 Baptism of Infants – Infants are welcomed into the life of Christ and the Catholic Church through baptism. Parents of the infants are asked to call the Parish office (432-682-6303) to make an appointment with a priest. After the appointment, one baptism class is required. Classes are usually scheduled on the second Sunday of the month. Beginning with the September class, parents and godparents must register for the class. Parents can register during their pre-baptism interview with the priests or deacons. Godparents can call the Parish Office (432-682-6303) to register. Baptisms are celebrated in groups usually on the Saturday after each monthly class. Baptisms of Adults – Adults are baptized through the Rite of Christian Initiation of Adults (RCIA). These baptisms usually take place on the evening before Easter. Call Alison at the Parish Office to inquire about RCIA.